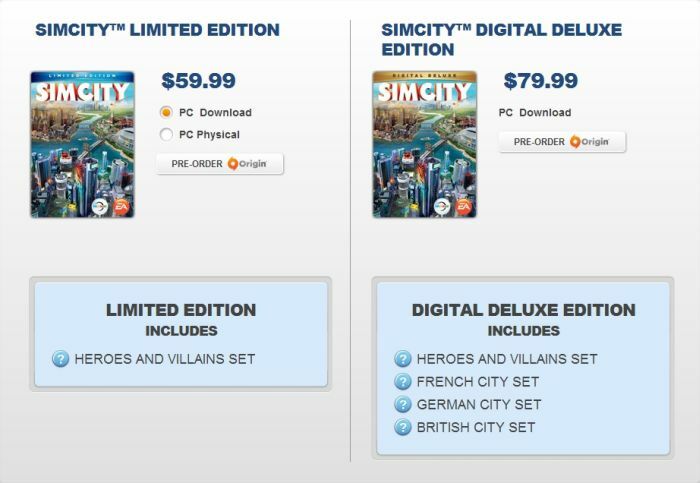 EA Games, I Just Don’t Like You #SimCity – Nomadic Gamers, eh! I love sim city. I’ve played pretty much every version of the game since it started – but I have a problem with EA and their latest sales pitch. See, I’m a firm believer that the game should come with THE GAME. All aspects of it. If I’m going to shell out $60 for a video game I want it to include the whole game and not have to micro transaction my way to unlocking the rest of the game. So. For $60 you get the game. It’s apparently a limited edition and comes with a heroes and villains set. Then there’s the ‘deluxe’ digital edition. That one comes with Heroes and villains, a French city, German city, and a British city. That’s a lot of money to spend. I mean that’s almost $100 CAN (and they tax at Origin, too) for a single video game. Digital. Yes, I pre-ordered the game. No, I didn’t get the deluxe. I simply can’t afford to spend that much money on three extra city sets. If I could afford it I’m sure I’d be all over it. Either way, I’m sad that in order to get this content we’ve got to shell out more money for an already expensive game. The details of what each city has as far as bonuses include things like special buildings to draw in more tourists and items that will make your citizens happier with you as mayor. I played the beta and enjoyed the game enough to go ahead and make the pre-purchase, I just wish that it actually came with all of the content. I’m part of the camp of not buying because of online only mode. It’ll be interesting to see your thoughts on it ! I love the SimCity series. I missed the earlier games, but SimCity 3000 ranks way up there with my most played games ever. The only reason I’m not rushing out to pre-order this iteration of SimCity is because I do not like the “thou shalt only play online” model, especially for games which are about creation. I don’t want my cities to exist only at the whim of EA choosing to keep the servers running. I still have all my Sc3K cities. Do I think that I ever will actually re-install SC3K and do anything with them? Maybe not, but I like that I could. If the reason for me not being able to go back and tinker with my favorite cities was because EA had turned off the servers, rather than just me having newer and shinier games to play, that would annoy me. So I debate pre-ordering this new SimCity. I might do so anyway, because, realistically, the servers will certainly be running long enough to be worth the $60 or $80 I spend on the game. But I might not. And if I don’t, and if I miss out on the pre-order bonus content, I’m even less likely to jump in and pick it up later. EA marketing strategists, make of that what you will.